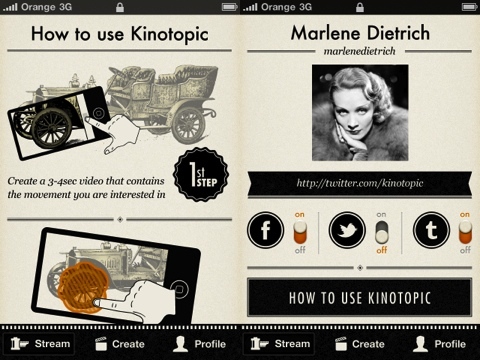 The Kinotopic iPhone app combines social aspects of Instagram with motion capabilities. The resulting motion-enhanced photo is a result of the finesse, talents, and perspectives of Kinotopic users–and it’s a pretty mixed bag. The Kinotopic iPhone app has a nicely designed and graphically interesting home screen. The navigation is accomplished via two bars–one at the top of the screen and the other at the bottom. The top bar has the sort and filter features for the Kinotopic social community. You can check out popular videos, people you follow, or simply the most recently loaded Kinotopic iPhone app productions. The bottom bar moves you between the news feed, the create icon, and your profile. Your profile is created via integration with Facebook or simple email registration. To get started making your motion-infused video, there is a helpful tutorial when you touch the create icon. You create an extremely short video with the motion you want to blend into a still photo from the same video, or you can create from a video in your iPhone library. I did the latter, as the Kinotopic built-in camera made my iPhone crash. Hopefully, you’ll be more successful. I selected a portion of an existing video of my son with his Lego robot. I chose the still photograph that would serve as the “anchor frame.” Then, the Kinotopic iPhone app processes the image, and you have the opportunity to define the area of motion. You can choose from several tools similar to InDesign and PDF programs. You can draw, erase, and zoom. The tools are extremely responsive. After you make adjustments and your Kinotopic image is created, you can choose to keep it private or share. The Kinotopic iPhone app is filled with helpful advice and prompts to move you through the interface. But, this is an app that requires commitment and practice. It’s probably very difficult for a novice to make a seamless video. If you want a disjointed, jumpy video, then you can certainly do that easily. To be truly successful like those in the popular Kinotopic news feed, you have to have an eye, some patience, and the ability to execute some delicate finger work on the iPhone screen. The graphic quality throws back to extremely early 20th century advertising, but in a very, very cool way. I would describe the vibe as modern Sears catalog. The font has presence and power, and the images juxtapose early technology like the Model T with an iPhone. It’s a witty aesthetic and perspective. The Kinotopic iPhone app is not for everyone, but those who use it well have a very cool, unique motion-enhanced photo to share. AppSafari review of Kinotopic was written by Jenni Ward on February 12th, 2012 and categorized under App Store, Free, Photos. Page viewed 3492 times, 1 so far today. Need help on using these apps? Please read the Help Page.